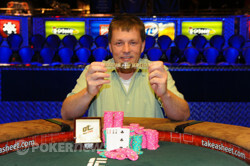 Congratulations to Mitch Schock, Event #39 Champion! Dating back to 2008, the $2,500 Pot-Limit Hold’em/Omaha event has been one of the most popular tournaments at the World Series of Poker; in fact, it is one of the few tournaments that has continued to grow each and every year. This year, the tournament drew 606 players, which was a 21% increase (124 players) over last year’s field. While 605 players fell by the wayside, Mitch Schock emerged as the last man standing to claim the $310,225 first-place prize and his first WSOP gold bracelet. At the start of Day 3, all eyes were on 2005 Main Event Champion Joe Hachem as he went for his second bracelet. 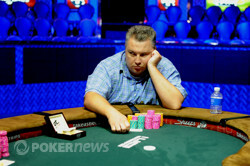 Unfortunately for the Aussie, he was unable to gain momentum and was busted shy of the final table in 12th place. Here is a look at those who hit the rail leading up to the final table. The headliner at the final table was none other than Rami Boukai, who happened to win this very event back in 2009 by defeating a field of 453 players to claim the $244,862 first-place prize. 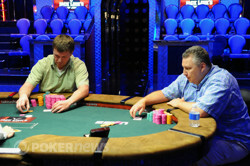 However, Boukai faced an uphill battle as he began the final table on the extreme short stack. Unfortunately there would be no title in store for Boukai as he was unable to mount a comeback from the short stack and was eliminated a PLO round by Tyler Patterson in ninth place ($23,119). Boukai was followed out the door a short time later by Jonas Mackoff, who was dispatched during a PLO round by Carter Gill in eighth place ($30,040). It took awhile for the next eliminations to occur, but it came when Gill busted both David Lestlock (7th- $39,539) and James Vanneman (6th- $52747) in the same hand of PLO, which thrust Gill into the chip lead. It was about this time that a huge hand developed between Patterson and Schock. It began when Patterson raised to 50,000 on the button and Schock defended in the big blind. The flop was and Schock check-called a bet of 55,000 from Patterson to see the turn. Schock checked a second time and Patterson fired out 125,000 only to see himself getting check-raised to 450,000. Patterson thought for a minute or two and moved all in, Schock nodded and called. The blanked on the river and the more than two-million chip pot was sent to Schock, who became the chip leader. Patterson was sent home in fifth place for $71,317. A back-and-forth battle commenced between the final four players that eventually saw Gill hit the rail in fourth place ($97,7773). Not long after, Jan Collado joined him after he got all in preflop and his failed to get their against Rodney Brown’s as the board ran out . His elimination left Schock (3,245,000) headed into heads-up play against Brown (1,300,000) with a 2.5-1 chip lead. Heads up play was long and tedious. Brown managed to chip up a bit by taking down the occasional pot, but it wasn’t until he made a great call that he was able to take the chip lead. In that hand, the board read and a lot of action had taken place. With over a million in the pot, Schock bet pot on the river, which was enough to put Brown all in. After a few minutes, Brown made the call and showed for bottom set. Schock just shook his head as he flipped over for a missed wrap. Not to be denied, Schock battled back in the three-and-a-half hour battle. He eventually reclaimed the chip leader and dispatched Brown in the early hours of Saturday morning. 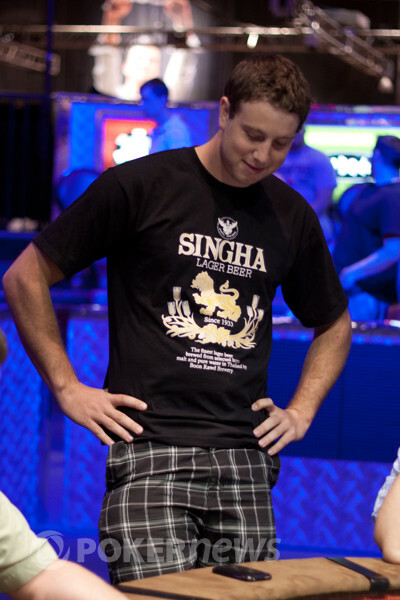 Today’s performance marked Schock’s fifth cash and third final table of the 2011 WSOP. His victory will no doubt go a long way in putting him in contention for the Player-of-the-Year Award (he was 72nd on the list headed into this event)! Congratulations to Mitch Schock on capturing his first bracelet and the $310,225 first-place prize. That does it for our coverage from Event #39 $2,500 Pot-Limit Hold’em/Omaha, but there is still plenty of tournament action to come. Stay tuned to PokerNews as our Live Reporting Team will be bringing you all the action and eliminations from the 2011 WSOP. Rodney Brown raised to 100,000 on the button and Mitch Schock made it 300,000 in the big blind. Brown made the call to see a flop of . Schock bet out 400,000 and Brown repotted all in and Brown wasted little time in making the call. Both had huge hands, Brown was holding top pair and a straight draw against Schock's aces and the nut flush draw for a pot that was well over the 2 million mark. The turn was the and as simple as that, it was all over as Schock fist-pumped making the nut flush. The river was academic and Brown, who had less than a couple of hours ago been one card away from winning the bracelet, was now out in second place and will no doubt be bitterly disappointed. He will have over $190,000 as a consolation prize however. This will be the last level of the night. If a winner isn't determined within the next hour, Mitch Schock and Rodney Brown will return tomorrow to play it out. 20 minute break, one more level and then the hard stop. Rodney Brown raised to 80,000 on the button and Mitch Schock made the call. When the flop came down , the crowd expected it to go check-check, as has been the M.O. for both players; however, this time Schock checked and Brown bet 105,000. Schock made the call and then both players checked the turn. Schock decided to take control of the pot by leading out for 350,000 on the river. Brown tanked for a long time, staring down his opponent, before making the call. "Flush," Schock said with confidence as he rolled over . Brown just shook his head and mucked his cards.